NEWARK, Del.--(BUSINESS WIRE)--Four exceptional students in pursuit of graduate degrees were each awarded a $20,000 Bridging the Dream Scholarship for Graduate Students from Sallie Mae, the nation’s saving, planning, and paying for college company. The students, joined by their family members, were surprised with the scholarships during what they believed were finalist interviews at Sallie Mae’s office in Newton, Massachusetts. More than 3,400 nominations were submitted from current and aspiring graduate students who were asked to creatively describe their journey to graduate school, who or what influenced them to pursue an advanced degree, and what advice they would give themselves as college freshmen. This year’s recipients are Tevin Ali of Florida, Albert Appouh of New Jersey, Noor Hasan of Illinois, and Cody Sain of Tennessee. Tevin Ali, 26, of Boynton Beach, Florida, is studying biotechnology enterprise and entrepreneurship at Johns Hopkins University, where he is aspiring to become a leader in genomics and an empowering speaker to create a positive impact on the STEM community and biotechnology industry. Ali earned his bachelor’s degree from Florida Atlantic University. Albert Appouh, 29, of Maplewood, New Jersey, is pursuing a Master of Science degree from Columbia University. Appouh is the founder of Newark Cares, a nonprofit association focused on community enrichment, and will use his master’s degree to continue making advancements for at-risk youth. Appouh earned his bachelor’s degree from Rutgers University. Noor Hasan, 26, of Skokie, Illinois, is studying law at the University of California, Berkeley. The youngest diversity strategist to have worked for a Fortune 100 company, Hasan is an advocate for inclusion in the workplace and beyond. Hasan earned her bachelor’s degree in English and Legal Studies, with a minor in Asian-American studies, from Northwestern University. Cody Sain, 22, of Humboldt, Tennessee, is a senior at the University of Tennessee majoring in microbiology with a minor in Africana studies. A volunteer at local health clinics partnering with community schools, Sain will graduate in May and pursue a medical degree at the University of Chicago Pritzker School of Medicine. According to “How America Pays for Graduate School,” the national study by Sallie Mae and Ipsos, two-thirds of grad students (64 percent) believe an advanced degree is the new minimum standard level of education for any professional occupation, and nearly all (95 percent) say an advanced degree is necessary to enter, advance, accelerate, or remain competitive in their chosen career. Scholarships, however, along with grants, fellowships, and tuition waivers, account for just 15 percent of funds used to pay for grad school. In response, Sallie Mae recently launched a new Graduate School Scholarship Search tool, which offers access to 850,000 graduate scholarships worth up to $1 billion. Available scholarships and fellowships run the gamut of graduate school disciplines, including business, law, medical, healthcare and nursing, engineering, and education, and range from a few thousand to tens of thousands of dollars. Sallie Mae’s Bridging the Dream Scholarship for Graduate School is an extension of the company’s Bridging the Dream Scholarship Program, which has awarded $225,000 in scholarships over the past two years to college-bound high school students. For additional information about saving, planning, and paying for graduate school, visit SallieMae.com. 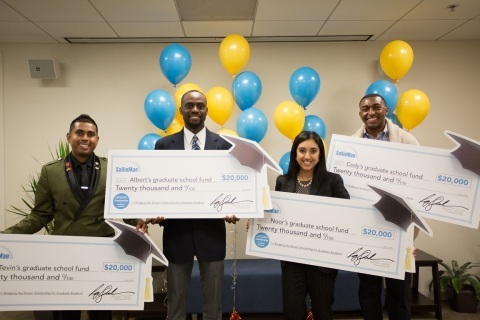 Sallie Mae awards four graduate students scholarships of $20,000 each.